Royal Caribbean Cruise Line knows how to offer a great deal. 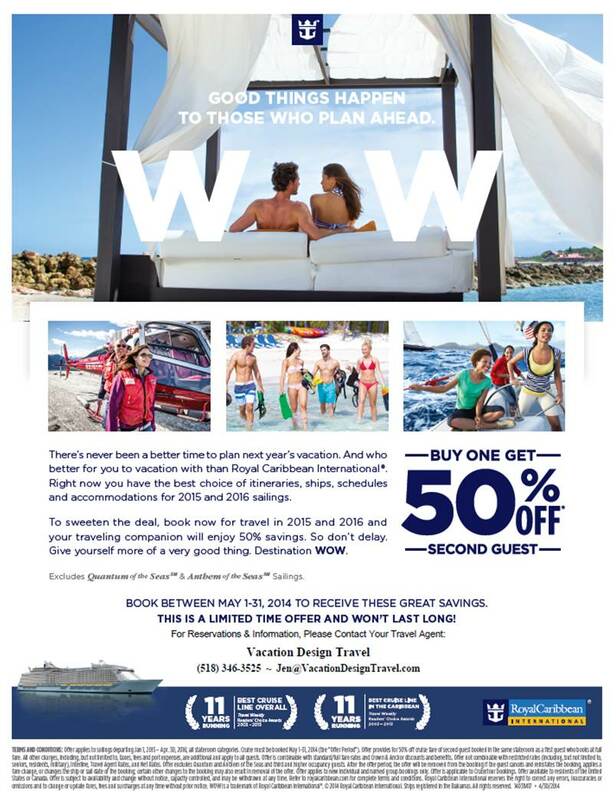 Book between May 1 and May 31, 2014, your cruise for 2015 or 2016, and your cruising companion cruises for HALF OFF! Your cruising companion must share your stateroom. Offer applies only to one companion in your stateroom. Third-Eighth guests in your stateroom pay regular Third-Eighth guest fares. Offer is for cruise fare only. Taxes, fees, port charges, etc., are additional and apply to all guests. Cruise between January 1, 2015 and April 30, 2016 on most ships, sailings and stateroom categories except Quantum and Anthem of the Seas sailings. Changes made to a reservation with this offer may result in removal of the offer from reservation. Offer is capacity controlled and other terms and conditions apply. Give me a call at (518) 346-3525 for prices, to book, or with any questions!